Dr. Joanne F. Vizzini is a Licensed Professional Counselor and a Nationally Certified Counselor. She received her Master's of Science Degree in Pastoral Counseling from Loyola University, Columbia, Maryland in September 1997. Dr. Vizzini completed the Doctoral Program for Pastoral Counseling at Loyola University, Columbia Maryland, January, 2003. She is an adjunct faculty member at Loyola University, has taught Clinical Case Supervision, Substance Abuse, and Group Counseling in Schools, and Diagnosis of Emotional and Mental Disorders at the graduate level. She supervises Master's and Doctoral level interns from the Pastoral Counseling Department. Click here to see photos from the July 2010 Workshop! Click here to see photos from previous workshops! Puppet Presentation at St. V's. Click here to see photos from the Puppet Therapy Workshop at Elmer Wolfe Elementary! Dr. Vizzini offers workshops on sensitive topics regarding the use of puppets as a therapeutic vehicle for healing. Dolls, including stuffed animals, are likely one of the oldest toys in human history and serve therapeutically as a transitional object between the traumatized client (childhood through adulthood) and their emotions. Puppets are simply dolls that can be manipulated to appear "real," resembling human characters. Puppets or puppets used as dolls help clients of all ages to travel between their inner experience and the present world. Dr Vizzini currently is approved to offer CE's through Maryland Board of Social Work (2007 to present). She has offered other CE's in the past and will research your discipline and particular need upon request for future workshops. Dr. Vizzini has provided clinical supervision for Master's level and Doctoral level students/clinicians over the past 14 years through Loyola University and private practice. She is an Approved Clinical Supervisor for the State of Maryland. Dr. Vizzini provides individual supervision for several Master's level clinicians each semester. She is in full-time private practice with offices in Mt. Washington, Maryland and Columbia, Maryland. Her caseload includes adults, youth and children with general mental health issues. She utilizes therapeutic puppets/dolls in her private practice. In the past, she offered puppet therapy for ten years at Breakthrough, a five-day intensive therapeutic experience run by Ms. Ann Smith, M.S., LMFT, LCPC, CAC. 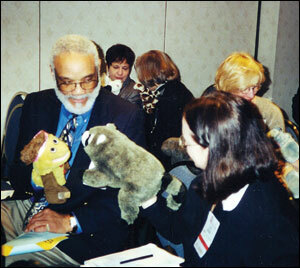 In 2007, she began the Puppet Therapy Institute to train others in using puppets in therapy. Formerly, she worked part-time at Metro Maryland Counseling Center with general mental health issues and at Epoch Counseling Center with men and women suffering from addiction. Dr. Vizzini counseled client's in group using puppet therapy as a co-therapist with Nancy Michaelson and at Cathedral House Re-entry Program for ten years. Prior to her Master's studies, taught elementary school. She is a Maryland State Certified Teacher with a specialty in early childhood education and special education. In 1980, she received a Maryland State Student Research Grant to utilize puppets as a teaching tool regarding learning disabilities. Her puppetry workshops have been presented at a multitude of venues since 1999, such as professional conferences with the American Counseling Association and the American Psychological Association to various churches and creative sites, such as Yama Studio, Baltimore, for yoga teacher training.